Recently the photographic opportunities at Texas City Dike were unexpectedly slim, so another trip to Galveston seemed like a good idea. The day was overcast but a bit windy. Real beachcombing is so much better in the Winter as there are not so many humans. Crowds of noisy folks scare off the birds and raise my blood pressure. It is fun to talk to fellow birders/photographers or share sightings of something interesting, but to have to listen to a parent pedantically explain ecology and nature to a pair of grade school-aged boys while allowing them to throw rocks at the birds is .... annoying to say the least. So, I was happy to find East Beach practically deserted. It is at the very tip of Galveston Island and includes the South Jetty. Which was covered with breaking waves and darting Sanderlings and two really brave fishermen. I took some photos of that scene, but none came out like what I had in my mind's eye. I was using the borrowed Sony A700 with the 70-400mm lens. I hope he doesn't start charging me rental fees. Taken last fall at Texas City Dike on a brighter day. Isn't that an amazing bird? 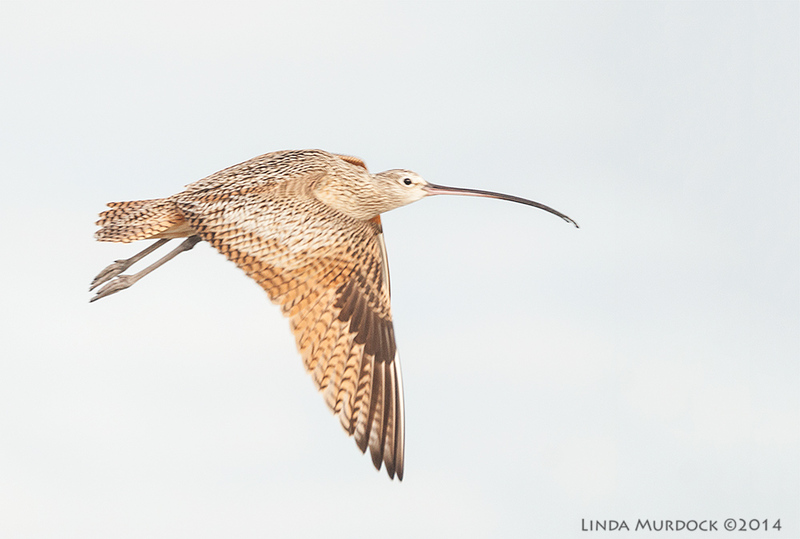 The Long-billed Curlew is North America's largest shorebird. The female's bill is longer than the males and has a slightly different curve. Of course, when you only have one to look at, you can't really determine the sexes. The one I saw a few months ago at Texas City Dike (shown at right) was obviously a youngster as juvenile's have a much shorter bill than the adults. Can't you tell? 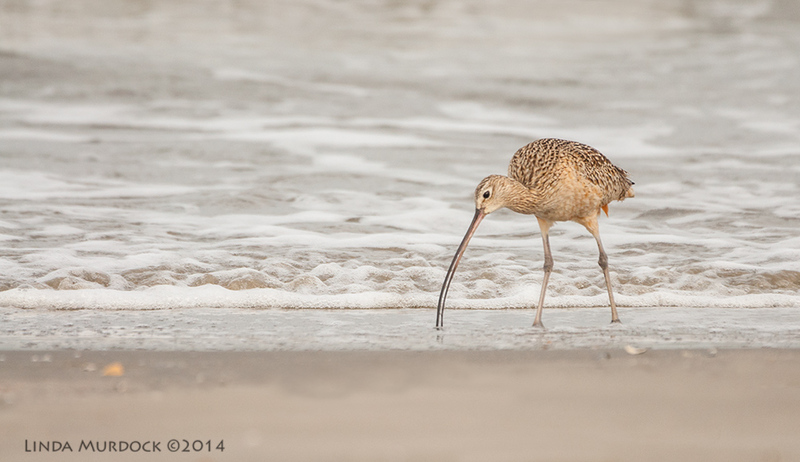 Long-billed Curlews winter along our Gulf Coast, but they breed in the grasslands of the western US. Males build the nest (a scrape on the ground) and females choose a mate. She contributes to lining the nest with twigs and sticks. Four eggs are laid. The females usually leave the fledglings to be cared for by the males after a few weeks. Irrespective of her minimum parenting investment, pairs usually mate again. Birds are so interesting! They use that long bill to probe and dig for crabs and invertebrates in the soft sand near the shore line. Curlews also eat grasshoppers and insects in open habitats. I saw this one eat a small crab; poor thing, I do think his foraging was totally interrupted by two photographers stalking him up and down the beach. We would follow his progress down the beach from a good distance away. Then one of us would go ahead and angle slowly toward the bird which would cause him to turn and go back the other way. Taking photos of a bird coming toward you is always more desirable. In the photo above, the bird decided he wanted to go to that shallow area near the jetty. But Bill was on one side and I was on the other. He would look at one of us, then the other and seemed totally confused. After a while, he turned back to the shore. While pursuing the curlew, I came upon this little tableau. The crab is dead, and has been investigated by both a Great Blue Heron and a rather large dog. I won't tell you how many images I took of this curlew. They aren't real common and you never see but one at a time. And you keep snapping, hoping he will raise his wings and show you that great cinnamon color on the underneath side, or grab a tasty treat. He tirelessly hunted in the breaking waves, and occasionally struck some interesting poses. Here is where patience pays off, you quietly follow the bird, not taking photos of him facing away... and... suddenly he will turn and you have to be ready. I missed some super-close shots because my battery ran out (you carry a spare in your pocket) and just after I replaced the battery, my card was full and had to be changed as well. That taught me to change cards when I have 10 or so left, and keep a better watch on the battery level. And y'all think this is easy. The beach was full of the usual trash you wish wasn't washing up, sunglasses, discards and bottle tops but occasionally a nice bit of nature. This might be a cormorant or even a Brown Pelican feather. And then he had enough of us and flew off down the beach. We had taken hundreds of photos; it was getting cooler, the wind was picking up and there was a long drive home in Friday afternoon traffic. 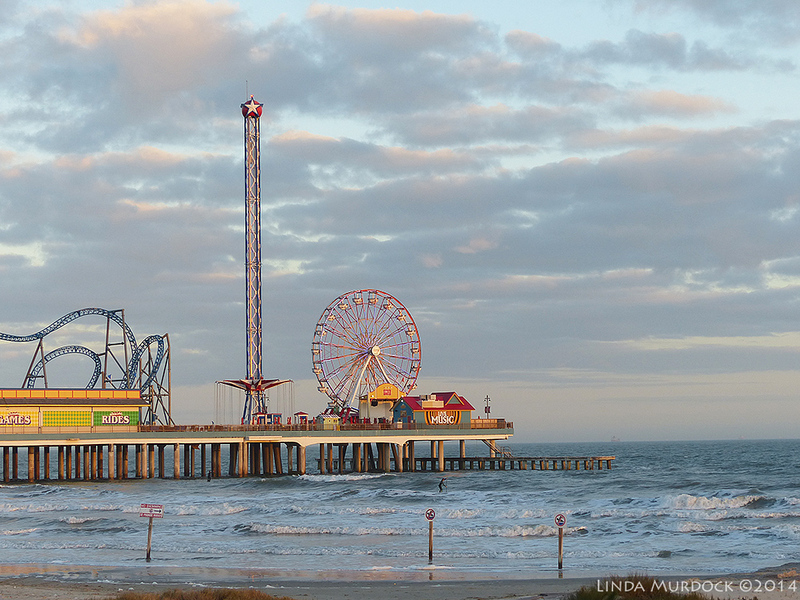 One last shot of the Galveston Pleasure Pier before heading out. The rides were in operation and yes, that is a surfboarding guy in a wet suit you can see heading out to catch the waves. Do you like going to the beach in winter? Do you mind being outside when it is cold? Or are you parked on the sofa with Netflix during these cold windy days? Let me know what you think about curlews in the comments.